Oof, what a busy little bee I have been! My boss (I am mini boss, she is big boss) is off for the next 3 and a half weeks. She's getting married. The cheek of it. I'm left running around like a headless chicken, files inexorably piling up at the end of my desk, fielding questions left, right and centre. I keep expecting everyone to realise that I'm actually not that good at my job, that I'm actually a child who's playing at being a grown up in her pencil skirts and her high heels. But apparently that's not going to happen. Apparently I'm coping rather well. Who knew. - Guitar Hero. How have I never played it before? How?! HOW?!! I love it. Lithium by Nirvana almost defeated me. Almost. I woke up yesterday morning with a claw for a hand (think Chandler from Friends playing Ms Pacman relentlessly) but I feel it's a small price to pay. - Lovely booze. I spent yesterday in Manchester with G and M. It was sunny! There was gin! And a chicken salad (the less said about that the better. Everyone else had a burger and chips and I've never been so envious). There was also running (not by me, but by the participants in the Great Manchester Run). - Not enough sleep. Again. Tut. - Baking. I have discovered the perfect cookie recipe. It makes gloriously soft cookies with a slightly chewy centre. 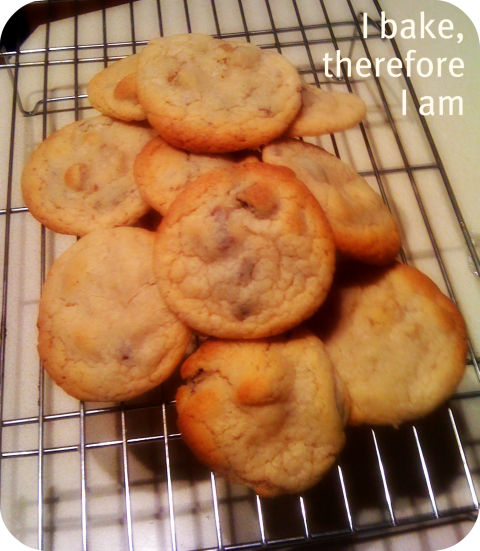 So I've been making batches of them. Super willpower woman I am though as I've only eaten a couple myself. The rest I've given to my parents and work colleagues. What about you, my lovelies?